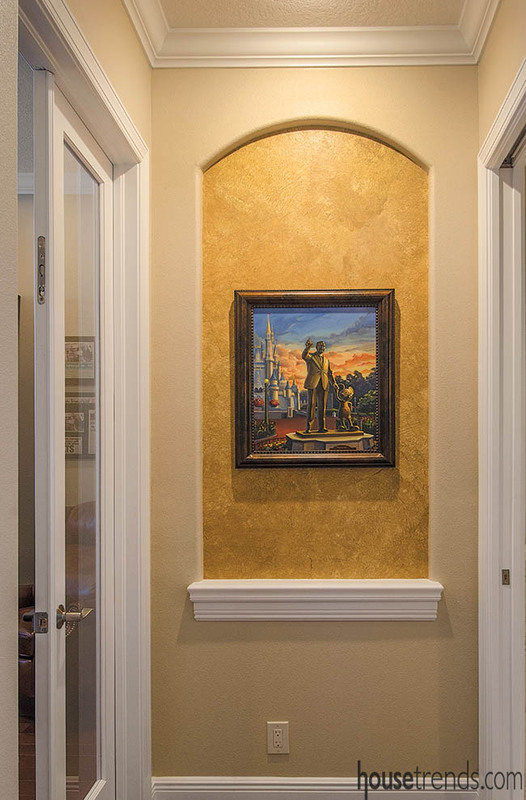 A wide driveway leads up to this custom home, built as a smart home to satisfy the husband with a magical, Disney-inspired interior design to satisfy the wife. Lynda Kutey has been having fun since she was three years old. Not just playing ball and skipping rope, but fancy, spectacular twists and turns on her roller skates. Her talent was enough to take her twice, as an adult, to the US Artistic Nationals Roller Skating competition. 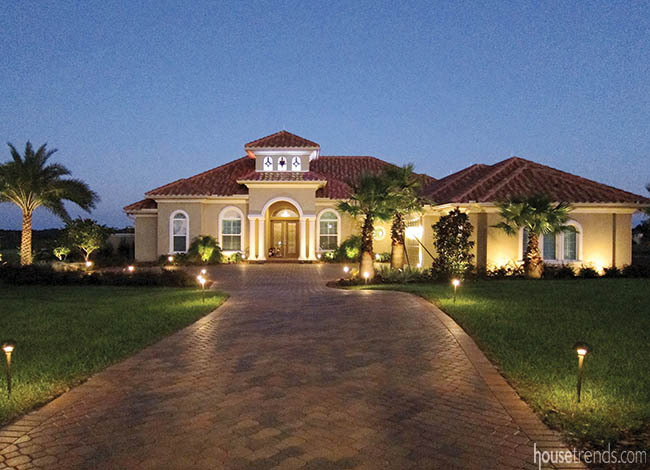 So you know that someone with a career like that would want to live in a very special home. 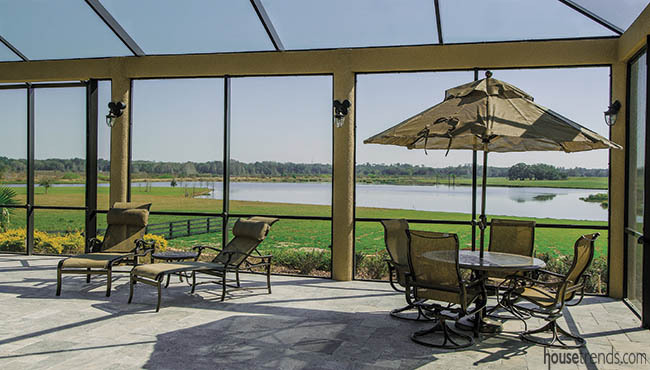 Six months ago, Lynda and her husband, John Kutey, moved from upstate New York to find some sunshine and privacy at the magnificent Stonelake Ranch in Thonotosassa, about twenty minutes east of Tampa. With one-and-a-half acres at a minimum, neighbors there can remain friendly but not too close. 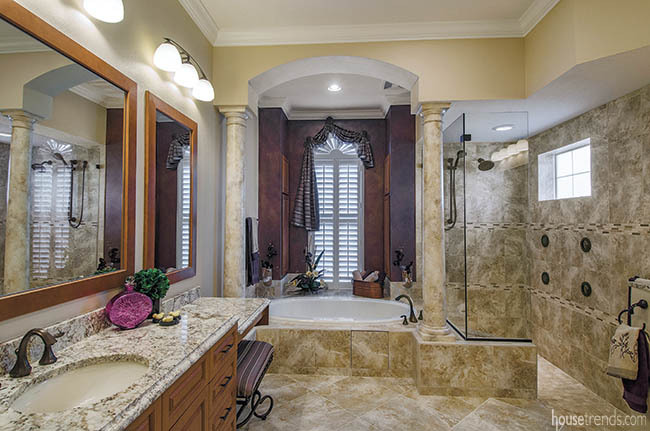 After researching existing residential properties, the Kuteys decided to build a lovely one-story on their four-acre lot. As a “Beekeeper” for a technology company named Hive, Jeff Harris is an expert on Smart homes, with a broad knowledge on everything from automation, structural wiring and renewable energy to security, lighting control and central vacuums. He and John clicked right away. 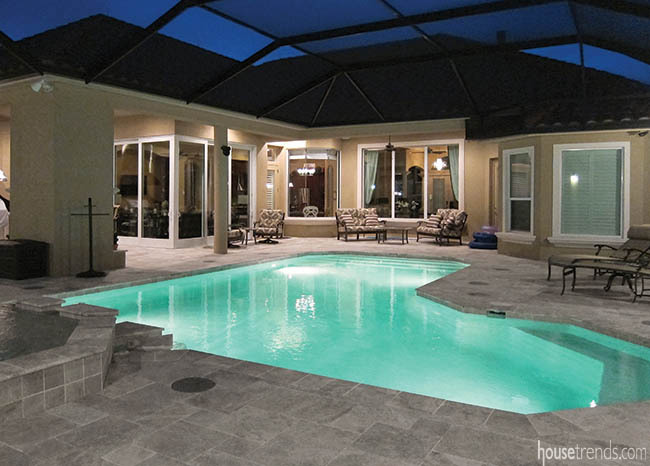 With the Hive approach, all sound abatement, thermostats, pathway lighting, door and garage locks…even speakers in the rocks surrounding the pool are all handled by a smart phone from anywhere in the world. Jeff met with the Kuteys and then submitted a detailed proposal that John and Lynda immediately approved. 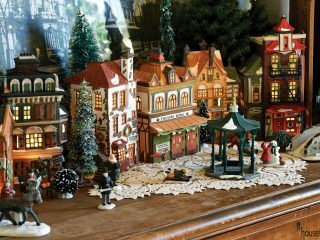 As the planning progressed, Lynda requested assistance in interior design, since she had long held a special interest in Mickey Mouse and had a large collection to accommodate into their living spaces. 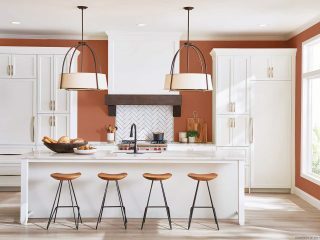 Fortunately, Jeff’s sister, Amy Butts, is an interior design consultant and, just as her brother had, quickly put together design boards that would give the couple the feel of paradise they wanted and incorporate the couple’s collection as well. 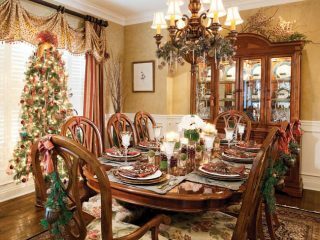 Finishing out the creative trio is Sherri Johns, Sales Manager of Annabelle’s Fine Home Furnishings, a well-known family-owned business that specializes in furniture and decorative accessories. Not unlike John and Jeff, Lynda quickly hit it off with Amy and Sherri. 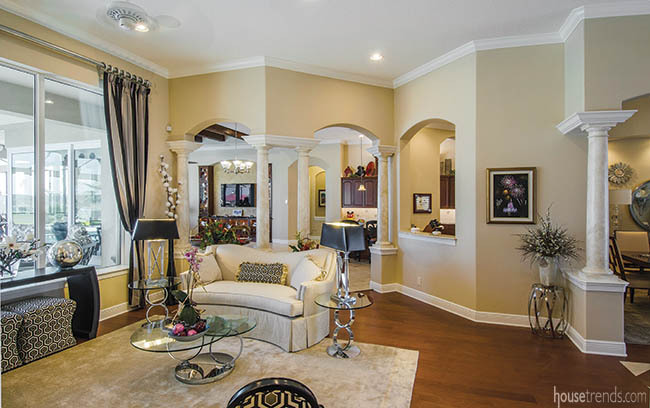 In fact, almost 90% of the interior furnishings and fabrics were chosen at Annabelle’s. 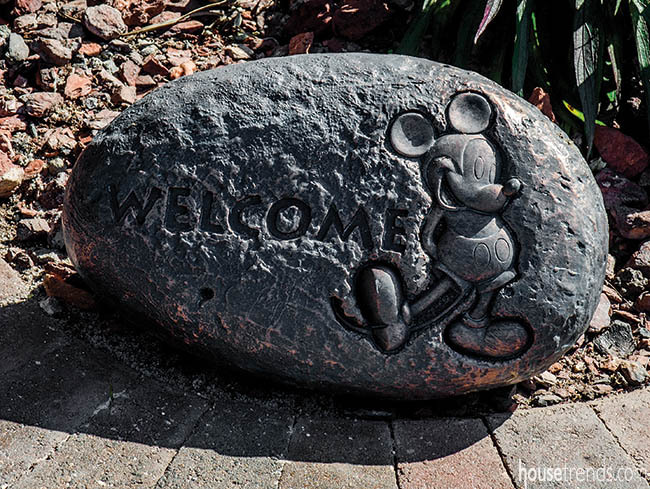 The Mickey Mouse design continues throughout the house and the outdoor living areas. 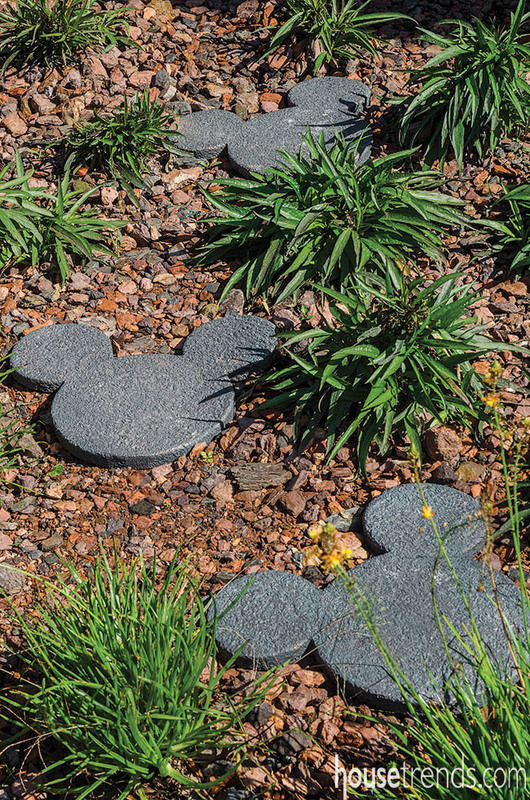 Stepping stones in the shape of the infamous mouse create a walkway through the yard, reminding everyone of Lynda’s playful attitude. Working together, Amy and Sherri selected furniture, fabrics and accessories room by room so that the flow of the residence would be maintained and the overall design unified. 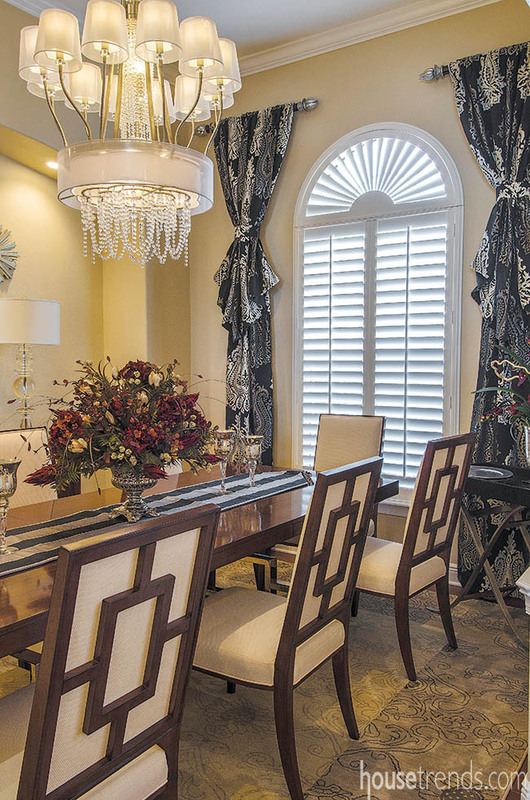 Amy installed custom white poly-satin shutters throughout the house. The living room, which overlooks the pool area and beyond that the lake, has a Stanford couch, Lexington chairs and two Vanguard ottomans, all with custom fabrics. 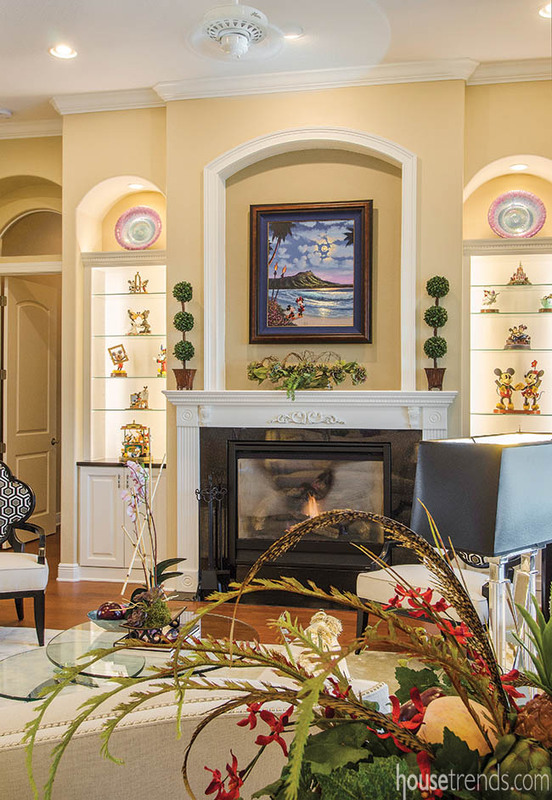 The crystal and chrome accents give a real sparkle to the room and the two lighted display cases on either side of the fireplace are filled with charming Mickey Mouse artifacts. 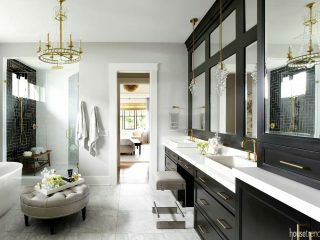 To the right of the entry, the chrome and walnut table and chairs are accented by custom floral patterns on the seats and a dramatic custom silk black and pewter runner down the center of the table. This lovely Romo fabric is also repeated in the living room drapes. Overhead is a custom crystal lamp and chandelier, an exclusive design from the Walt Disney collection. The Disney collection also appears in the nearby guest powder bath. The kitchen features Old Biscayne cabinetry with a combination of bar stools and chairs. Since John once was a meat manager who changed careers to information technology, the GE Profile convection oven with a sensor plug-in to assure perfect temperatures, has become his favorite appliance. 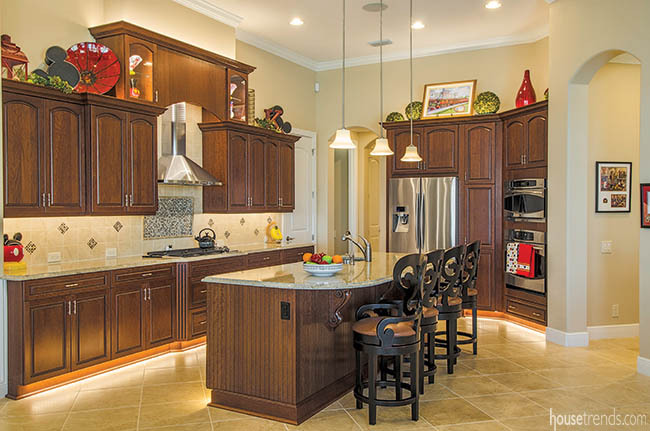 These appliances are coordinated by beautiful granite countertops. 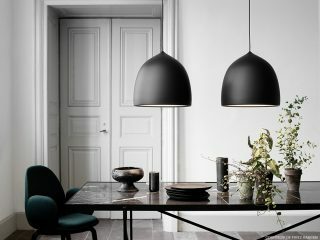 Three LED pendant lights hang gracefully over the breakfast bar. Relaxing is easy in the nearby family room, with custom drapes and a rug from the Disney Collection, the comfy sectional and ottoman are very inviting. Small occasional tables by Lexington have bases of petrified wood. John’s den features a Fairfield leather executive chair accentuated by a desk, entertainment center and built-in custom cabinetry by Amoroso Cabinets. 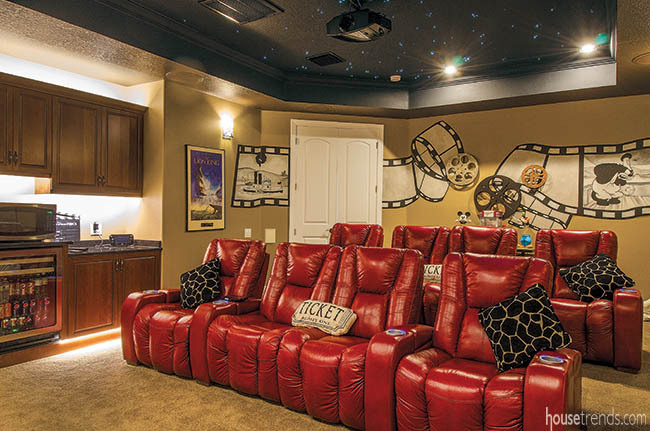 One of Jeff Harris’ biggest challenges was the starlit ceiling for the home theater. In addition to eight cerise leather motorized recliners, the Kuteys’ media room walls are lined to be totally blacked out when watching movies or videos, but decorated with Roman shades with striking red and black cornices for interesting color and design. To top it all off, Jeff cut 2,100 individual holes in the ceiling through which to fish fiber optic lines. When cut with a soldering knife, the fiber end melts and causes the twinkle effect when the switch is turned on. The master suite offers a feeling of escaping to Nirvana thanks to coordinated shades of browns, beiges and iridescent plum antique bronze window treatments. 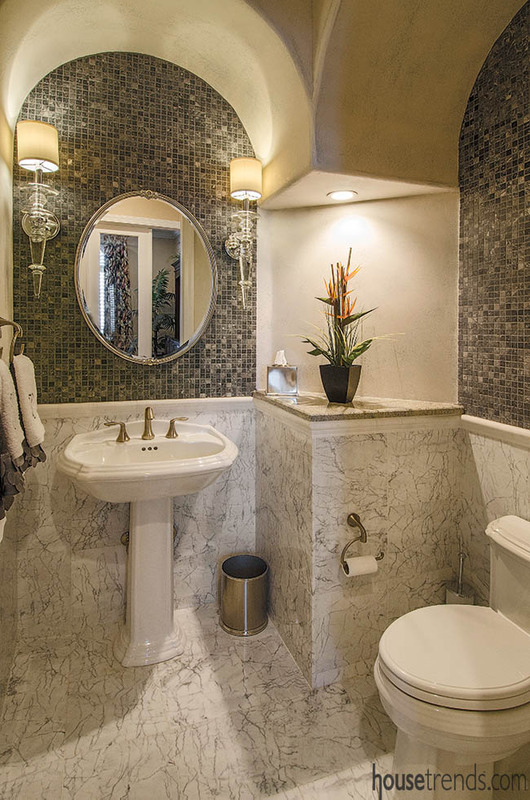 A cozy seating area and a bathroom boasting marble tile, an oversized tub and a large walk-in shower encourage relaxation. 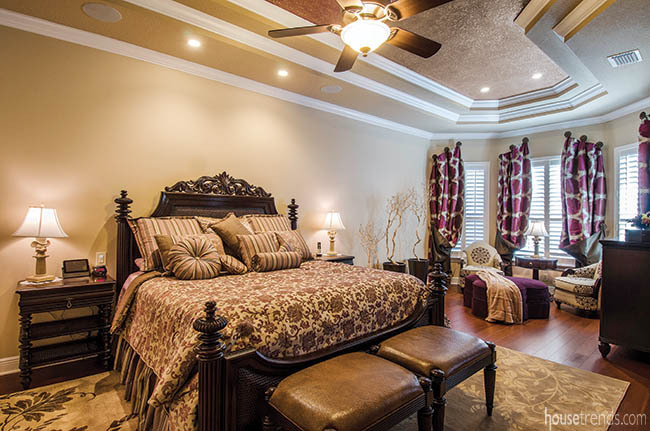 Two other guest bedrooms continue the Disney theme. Both the Animal Kingdom and the Wilderness Lodge bedrooms feature Keystone furnishings with coordinated Eastern accents bedding. In fact, Lynda saw the Animal Kingdom room at Annabelle’s and decided she wanted to duplicate it as is. 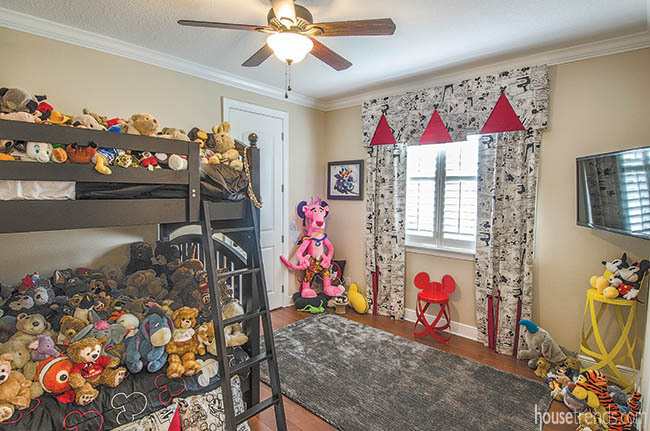 The most fascinating room has Stanley Youth bunk beds literally filled with Lynda’s collection of stuffed dolls and animals—some of them from childhood, showing a little wear and tear, and many others purchased at Disney World, of course. Even the drapes continue the theme.